There is an immense size variation in vertebrate red blood cells, as well as a correlation between cell and nucleus size. Mammalian red blood cells, which do not contain nuclei, are considerably smaller than those of most other vertebrates. 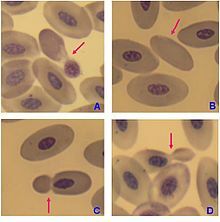 Mature red blood cells of birds have a nucleus, however in the blood of adult females of penguin Pygoscelis papua enucleated red blood cells (B) have been observed, but with very low frequency. Almost all vertebrates, including all mammals and humans, have red blood cells. Red blood cells are cells present in blood in order to transport oxygen. The only known vertebrates without red blood cells are the crocodile icefish (family Channichthyidae); they live in very oxygen-rich cold water and transport oxygen freely dissolved in their blood. While they no longer use hemoglobin, remnants of hemoglobin genes can be found in their genome. Vertebrate red blood cells consist mainly of hemoglobin, a complex metalloprotein containing heme groups whose iron atoms temporarily bind to oxygen molecules (O2) in the lungs or gills and release them throughout the body. Oxygen can easily diffuse through the red blood cell's cell membrane. Hemoglobin in the red blood cells also carries some of the waste product carbon dioxide back from the tissues; most waste carbon dioxide, however, is transported back to the pulmonary capillaries of the lungs as bicarbonate (HCO3−) dissolved in the blood plasma. Myoglobin, a compound related to hemoglobin, acts to store oxygen in muscle cells. Having oxygen-carrying proteins inside specialized cells (as opposed to oxygen carriers being dissolved in body fluid) was an important step in the evolution of vertebrates as it allows for less viscous blood, higher concentrations of oxygen, and better diffusion of oxygen from the blood to the tissues. The size of red blood cells varies widely among vertebrate species; red blood cell width is on average about 25% larger than capillary diameter, and it has been hypothesized that this improves the oxygen transfer from red blood cells to tissues. 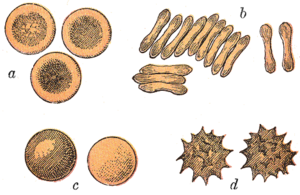 Typical mammalian red blood cells: (a) seen from surface; (b) in profile, forming rouleaux; (c) rendered spherical by water; (d) rendered crenate (shrunken and spiky) by salt. (c) and (d) do not normally occur in the body. The last two shapes are due to water being transported into, and out of, the cells, by osmosis. The red blood cells of mammals are typically shaped as biconcave disks: flattened and depressed in the center, with a dumbbell-shaped cross section, and a torus-shaped rim on the edge of the disk. This shape allows for a high surface-area-to-volume (SA/V) ratio to facilitate diffusion of gases. However, there are some exceptions concerning shape in the artiodactyl order (even-toed ungulates including cattle, deer, and their relatives), which displays a wide variety of bizarre red blood cell morphologies: small and highly ovaloid cells in llamas and camels (family Camelidae), tiny spherical cells in mouse deer (family Tragulidae), and cells which assume fusiform, lanceolate, crescentic, and irregularly polygonal and other angular forms in red deer and wapiti (family Cervidae). Members of this order have clearly evolved a mode of red blood cell development substantially different from the mammalian norm. Overall, mammalian red blood cells are remarkably flexible and deformable so as to squeeze through tiny capillaries, as well as to maximize their apposing surface by assuming a cigar shape, where they efficiently release their oxygen load. Red blood cells in mammals are unique amongst vertebrates as they do not have nuclei when mature. Red blood cells of mammals cells have nuclei during early phases of erythropoiesis, but extrude them during development as they mature; this provides more space for hemoglobin. The red blood cells without nuclei, called reticulocytes, subsequently lose all other cellular organelles such as their mitochondria, Golgi apparatus and endoplasmic reticulum. Scanning electron micrograph of blood cells. From left to right: human red blood cell, thrombocyte (platelet), leukocyte. A typical human red blood cell has a disk diameter of approximately 6.2–8.2 µm and a thickness at the thickest point of 2–2.5 µm and a minimum thickness in the centre of 0.8–1 µm, being much smaller than most other human cells. These cells have an average volume of about 90 fL with a surface of about 136 μm2, and can swell up to a sphere shape containing 150 fL, without membrane distension. Adult humans have roughly 20–30 trillion red blood cells at any given time, constituting approximately 70% of all cells by number. Women have about 4–5 million red blood cells per microliter (cubic millimeter) of blood and men about 5–6 million; people living at high altitudes with low oxygen tension will have more. Red blood cells are thus much more common than the other blood particles: there are about 4,000–11,000 white blood cells and about 150,000–400,000 platelets per microliter. Human red blood cells take on average 60 seconds to complete one cycle of circulation. The blood's red color is due to the spectral properties of the hemic iron ions in hemoglobin. Each human red blood cell contains approximately 270 million of these hemoglobin molecules. Each hemoglobin molecule carries four heme groups; hemoglobin constitutes about a third of the total cell volume. Hemoglobin is responsible for the transport of more than 98% of the oxygen in the body (the remaining oxygen is carried dissolved in the blood plasma). The red blood cells of an average adult human male store collectively about 2.5 grams of iron, representing about 65% of the total iron contained in the body. Red blood cells in mammals anucleate when mature, meaning that they lack a cell nucleus. In comparison, the red blood cells of other vertebrates have nuclei; the only known exceptions are salamanders of the genus Batrachoseps and fish of the genus Maurolicus. The elimination of the nucleus in vertebrate red blood cells has been offered as an explanation for the subsequent accumulation of non-coding DNA in the genome. The argument runs as follows: Efficient gas transport requires red blood cells to pass through very narrow capillaries, and this constrains their size. In the absence of nuclear elimination, the accumulation of repeat sequences is constrained by the volume occupied by the nucleus, which increases with genome size. Red blood cells are deformable, flexible, are able to adhere to other cells, and are able to interface with immune cells. Their membrane plays many roles in this. These functions are highly dependent on the membrane composition. The red blood cell membrane is composed of 3 layers: the glycocalyx on the exterior, which is rich in carbohydrates; the lipid bilayer which contains many transmembrane proteins, besides its lipidic main constituents; and the membrane skeleton, a structural network of proteins located on the inner surface of the lipid bilayer. Half of the membrane mass in human and most mammalian red blood cells are proteins. The other half are lipids, namely phospholipids and cholesterol. The most common red blood cell membrane lipids, schematically disposed as they are distributed on the bilayer. Relative abundances are not at scale. The red blood cell membrane comprises a typical lipid bilayer, similar to what can be found in virtually all human cells. Simply put, this lipid bilayer is composed of cholesterol and phospholipids in equal proportions by weight. 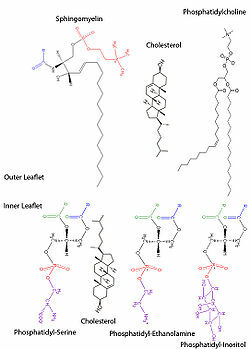 The lipid composition is important as it defines many physical properties such as membrane permeability and fluidity. Additionally, the activity of many membrane proteins is regulated by interactions with lipids in the bilayer. The presence of specialized structures named "lipid rafts" in the red blood cell membrane have been described by recent studies. These are structures enriched in cholesterol and sphingolipids associated with specific membrane proteins, namely flotillins, stomatins (band 7), G-proteins, and β-adrenergic receptors. Lipid rafts that have been implicated in cell signaling events in nonerythroid cells have been shown in erythroid cells to mediate β2-adregenic receptor signaling and increase cAMP levels, and thus regulating entry of malarial parasites into normal red cells. The proteins of the membrane skeleton are responsible for the deformability, flexibility and durability of the red blood cell, enabling it to squeeze through capillaries less than half the diameter of the red blood cell (7–8 μm) and recovering the discoid shape as soon as these cells stop receiving compressive forces, in a similar fashion to an object made of rubber. There are currently more than 50 known membrane proteins, which can exist in a few hundred up to a million copies per red blood cell. Approximately 25 of these membrane proteins carry the various blood group antigens, such as the A, B and Rh antigens, among many others. These membrane proteins can perform a wide diversity of functions, such as transporting ions and molecules across the red cell membrane, adhesion and interaction with other cells such as endothelial cells, as signaling receptors, as well as other currently unknown functions. The blood types of humans are due to variations in surface glycoproteins of red blood cells. Disorders of the proteins in these membranes are associated with many disorders, such as hereditary spherocytosis, hereditary elliptocytosis, hereditary stomatocytosis, and paroxysmal nocturnal hemoglobinuria. The zeta potential is an electrochemical property of cell surfaces that is determined by the net electrical charge of molecules exposed at the surface of cell membranes of the cell. The normal zeta potential of the red blood cell is −15.7 millivolts (mV). Much of this potential appears to be contributed by the exposed sialic acid residues in the membrane: their removal results in zeta potential of −6.06 mV. When red blood cells undergo shear stress in constricted vessels, they release ATP, which causes the vessel walls to relax and dilate so as to promote normal blood flow. When their hemoglobin molecules are deoxygenated, red blood cells release S-nitrosothiols, which also act to dilate blood vessels, thus directing more blood to areas of the body depleted of oxygen. Red blood cells can also synthesize nitric oxide enzymatically, using L-arginine as substrate, as do endothelial cells. Exposure of red blood cells to physiological levels of shear stress activates nitric oxide synthase and export of nitric oxide, which may contribute to the regulation of vascular tonus. Red blood cells can also produce hydrogen sulfide, a signalling gas that acts to relax vessel walls. It is believed that the cardioprotective effects of garlic are due to red blood cells converting its sulfur compounds into hydrogen sulfide. Red blood cells also play a part in the body's immune response: when lysed by pathogens such as bacteria, their hemoglobin releases free radicals, which break down the pathogen's cell wall and membrane, killing it. As a result of not containing mitochondria, red blood cells use none of the oxygen they transport; instead they produce the energy carrier ATP by the glycolysis of glucose and lactic acid fermentation on the resulting pyruvate. Furthermore, the pentose phosphate pathway plays an important role in red blood cells; see glucose-6-phosphate dehydrogenase deficiency for more. As red blood cells contain no nucleus, protein biosynthesis is currently assumed to be absent in these cells. Because of the lack of nuclei and organelles, mature red blood cells do not contain DNA and cannot synthesize any RNA, and consequently cannot divide and have limited repair capabilities. The inability to carry out protein synthesis means that no virus can evolve to target mammalian red blood cells. However, infection with parvoviruses (such as human parvovirus B19) can affect erythroid precursors, as recognized by the presence of giant pronormoblasts with viral particles and inclusion bodies, thus temporarily depleting the blood of reticulocytes and causing anemia. Erythropoiesis is the process by which new red blood cells are produced; it lasts about 7 days. Through this process red blood cells are continuously produced in the red bone marrow of large bones. (In the embryo, the liver is the main site of red blood cell production.) The production can be stimulated by the hormone erythropoietin (EPO), synthesised by the kidney. Just before and after leaving the bone marrow, the developing cells are known as reticulocytes; these constitute about 1% of circulating red blood cells. The functional lifetime of a red blood cell is about 100–120 days, during which time the red blood cells are continually moved by the blood flow push (in arteries), pull (in veins) and a combination of the two as they squeeze through microvessels such as capillaries. They are also recycled in the bone marrow. The aging red blood cell undergoes changes in its plasma membrane, making it susceptible to selective recognition by macrophages and subsequent phagocytosis in the mononuclear phagocyte system (spleen, liver and lymph nodes), thus removing old and defective cells and continually purging the blood. This process is termed eryptosis, red blood cell programmed cell death. This process normally occurs at the same rate of production by erythropoiesis, balancing the total circulating red blood cell count. Eryptosis is increased in a wide variety of diseases including sepsis, haemolytic uremic syndrome, malaria, sickle cell anemia, beta-thalassemia, glucose-6-phosphate dehydrogenase deficiency, phosphate depletion, iron deficiency and Wilson's disease. Eryptosis can be elicited by osmotic shock, oxidative stress, energy depletion as well as a wide variety of endogenous mediators and xenobiotics. Excessive eryptosis is observed in red blood cells lacking the cGMP-dependent protein kinase type I or the AMP-activated protein kinase AMPK. Inhibitors of eryptosis include erythropoietin, nitric oxide, catecholamines and high concentrations of urea. Much of the resulting breakdown products are recirculated in the body. The heme constituent of hemoglobin are broken down into iron (Fe3+) and biliverdin. The biliverdin is reduced to bilirubin, which is released into the plasma and recirculated to the liver bound to albumin. The iron is released into the plasma to be recirculated by a carrier protein called transferrin. Almost all red blood cells are removed in this manner from the circulation before they are old enough to hemolyze. Hemolyzed hemoglobin is bound to a protein in plasma called haptoglobin, which is not excreted by the kidney. Red blood cells may be given as part of a blood transfusion. Blood may be donated from another person, or stored by the recipient at an earlier date. Donated blood usually requires screening to ensure that donors do not contain risk factors for the presence of blood-borne diseases, or will not suffer themselves by giving blood. Blood is usually collected and tested for common or serious Blood-borne diseases including Hepatitis B, Hepatitis C and HIV. The blood type (A, B, AB, or O) or the blood product is identified. This relates to the presence of antigens on the cell's surface. After this process, the blood is stored, and within a short duration is used. Blood can be given as a whole product or the red blood cells separated as packed red blood cells. Blood is often transfused when there is known anaemia, active bleeding, or when there is an expectation of serious blood loss, such as prior to an operation. Before blood is given, a small sample of the recipient's blood is tested with the transfusion in a process known as cross-matching. In addition to the transmission of infection, certain types of transfusion reaction. In 2008 it was reported that human embryonic stem cells had been successfully coaxed into becoming red blood cells in the lab. The difficult step was to induce the cells to eject their nucleus; this was achieved by growing the cells on stromal cells from the bone marrow. It is hoped that these artificial red blood cells can eventually be used for blood transfusions. Several blood tests involve red blood cells. These include a RBC count (the number of red blood cells per volume of blood), calculation of the hematocrit (percentage of blood volume occupied by red blood cells), and the erythrocyte sedimentation rate. The blood type needs to be determined to prepare for a blood transfusion or an organ transplantation. Many diseases involving red blood cells are diagnosed with a blood film (or peripheral blood smear), where a thin layer of blood is smeared on a microscope slide. This may reveal abnormalities of red blood cell shape and form. When red blood cells sometimes occur as a stack, flat side next to flat side. This is known as rouleaux formation, and it occurs more often if the levels of certain serum proteins are elevated, as for instance during inflammation. Some athletes have tried to improve their performance by blood doping: first about 1 litre of their blood is extracted, then the red blood cells are isolated, frozen and stored, to be reinjected shortly before the competition. (Red blood cells can be conserved for 5 weeks at −79 °C or −110 °F, or over 10 years using cryoprotectants) This practice is hard to detect but may endanger the human cardiovascular system which is not equipped to deal with blood of the resulting higher viscosity. Another method of blood doping involves injection with erythropoietin in order to stimulate production of red blood cells. Both practices are banned by the World Anti-Doping Agency. ^ Vinay Kumar; Abul K. Abbas; Nelson Fausto; Richard N. Mitchell (2007). Robbins Basic Pathology (8th ed.). Saunders. ^ "Blood Cells". Archived from the original on 2016-07-23. ^ a b J. A. Blom (15 December 2003). Monitoring of Respiration and Circulation. CRC Press. p. 27. ISBN 978-0-203-50328-7. ^ a b Gulliver, G. (1875). 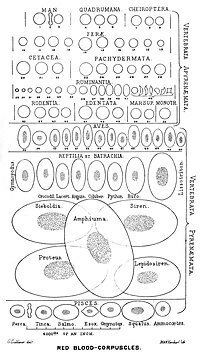 "On the size and shape of red corpuscles of the blood of vertebrates, with drawings of them to a uniform scale, and extended and revised tables of measurements". Proceedings of the Zoological Society of London. 1875: 474–495. ^ Ruud JT (May 1954). "Vertebrates without erythrocytes and blood pigment". Nature. 173 (4410): 848–50. Bibcode:1954Natur.173..848R. doi:10.1038/173848a0. PMID 13165664. ^ Carroll, Sean (2006). The Making of the Fittest. W.W. Norton. ISBN 978-0-393-06163-5. ^ Snyder, Gregory K.; Sheafor, Brandon A. (1999). "Red Blood Cells: Centerpiece in the Evolution of the Vertebrate Circulatory System". Integrative and Comparative Biology. 39 (2): 189. doi:10.1093/icb/39.2.189. ^ "BBC Bitesize – GCSE Biology – Blood – Revision 2". www.bbc.co.uk. Retrieved 2017-11-26. ^ Gregory TR (2001). "The bigger the C-value, the larger the cell: genome size and red blood cell size in vertebrates". Blood Cells, Molecules & Diseases. 27 (5): 830–43. CiteSeerX 10.1.1.22.9555. doi:10.1006/bcmd.2001.0457. PMID 11783946. ^ Bianconi, Eva; Piovesan, Allison; Facchin, Federica; Beraudi, Alina; Casadei, Raffaella; Frabetti, Flavia; Vitale, Lorenza; Pelleri, Maria Chiara; Tassani, Simone (2013-11-01). "An estimation of the number of cells in the human body". Annals of Human Biology. 40 (6): 463–471. doi:10.3109/03014460.2013.807878. ISSN 0301-4460. PMID 23829164. ^ Hillman, Robert S.; Ault, Kenneth A.; Rinder, Henry M. (2005). Hematology in Clinical Practice: A Guide to Diagnosis and Management (4 ed.). McGraw-Hill Professional. p. 1. ISBN 978-0-07-144035-6. ^ D’Alessandro, Angelo (2017). "Red blood cell proteomics update: is there more to discover?". Blood Transfusion. 15 (2): 182–187. doi:10.2450/2017.0293-16. PMC 5336341. PMID 28263177. ^ Cohen, W. D. (1982). "The cytomorphic system of anucleate non-mammalian erythrocytes". Protoplasma. 113: 23–32. doi:10.1007/BF01283036. ^ Wingstrand KG (1956). "Non-nucleated erythrocytes in a teleostean fish Maurolicus mülleri (Gmelin)". Zeitschrift für Zellforschung und Mikroskopische Anatomie. 45 (2): 195–200. doi:10.1007/BF00338830 (inactive 2019-02-15). PMID 13402080. ^ Gregory, T. R. (2001). "The Bigger the C-Value, the Larger the Cell: Genome Size and Red Blood Cell Size in Vertebrates". Blood Cells, Molecules and Diseases. 27 (5): 830–843. CiteSeerX 10.1.1.22.9555. doi:10.1006/bcmd.2001.0457. PMID 11783946. ^ Hempelmann E, Götze O (1984). 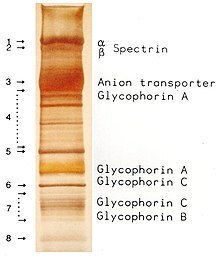 "Characterization of membrane proteins by polychromatic silver staining". Hoppe-Seyler's Z Physiol Chem. 365: 241–242. ^ Denomme GA (July 2004). "The structure and function of the molecules that carry human red blood cell and platelet antigens". Transfusion Medicine Reviews. 18 (3): 203–31. doi:10.1016/j.tmrv.2004.03.006. PMID 15248170. ^ Kleinbongard P, Schutz R, Rassaf T, et al. (2006). "Red blood cells express a functional endothelial nitric oxide synthase". Blood. 107 (7): 2943–51. doi:10.1182/blood-2005-10-3992. PMID 16368881. ^ Benavides, Gloria A; Victor M Darley-Usmar; Mills, R. W.; Patel, H. D.; Isbell, T. S.; Patel, R. P.; Darley-Usmar, V. M.; Doeller, J. E.; Kraus, D. W. (2007-11-13). "Hydrogen sulfide mediates the vasoactivity of garlic". Proceedings of the National Academy of Sciences of the United States of America. 104 (46): 17977–17982. Bibcode:2007PNAS..10417977B. doi:10.1073/pnas.0705710104. PMC 2084282. PMID 17951430. ^ Jr, Jeremy M. Berg, John L. Tymoczko, Lubert Stryer; with Gregory J. Gatto (2012). Biochemistry (7th ed.). New York: W.H. Freeman. pp. 455, 609. ISBN 9781429229364. ^ Tilton, WM; Seaman, C; Carriero, D; Piomelli, S (August 1991). "Regulation of glycolysis in the erythrocyte: role of the lactate/pyruvate and NAD/NADH ratios". The Journal of Laboratory and Clinical Medicine. 118 (2): 146–52. PMID 1856577. ^ Erik D. Heegaard & Kevin E. Brown (July 2002). "Human parvovirus B19". Clin Microbiol Rev. 15 (3): 485–505. doi:10.1128/CMR.15.3.485-505.2002. PMC 118081. PMID 12097253. ^ Harrison, K. L. (1979). "Fetal Erythrocyte Lifespan". Journal of Paediatrics and Child Health. 15 (2): 96–97. doi:10.1111/j.1440-1754.1979.tb01197.x. ^ Higgins, John (2014). "Red Blood Cell Population Dynamics". Clinics in Laboratory Medicine. 35 (1): 43–57. doi:10.1016/j.cll.2014.10.002. PMC 4717490. PMID 25676371. ^ "Circular of Information for Blood and Blood Products" (PDF). American Association of Blood Banks, American Red Cross, America's Blood Centers. Archived from the original (PDF) on 2011-10-30. Retrieved 2010-11-01. ^ Sparacino, Linette; Manning, Frederick J.; Availability, Institute of Medicine (US) Forum on Blood Safety and Blood (8 February 1996). "Frozen Red Cell Technology". National Academies Press (US) – via www.ncbi.nlm.nih.gov. ^ "Max F. Perutz - Biographical". NobelPrize.org. Retrieved 23 October 2018.